Historical Food Fortnightly Challenge 2: Revisiting the "Lemon Wafer Adventure!" 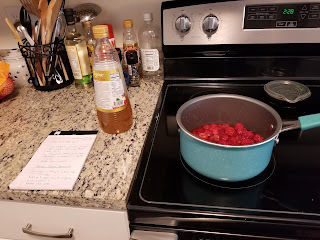 The Historical Food Fortnightly challenge this past fortnight was to revisit and redo a previous recipe challenge (or a recipe you've done often) to see if it could be done a different way. I chose to revisit a previous challenge I did back at the end of September, the "Lemon Wafer Adventure!". If you haven't checked it out, please do! The backstory with this particular challenge was that a group I've been following called EMROC (Early Modern Recipes Online Collective) had transcribed a cook/pharmaceutical book written by an English woman named Jane Dawson who lived in the later half of the 17th century. The exact years and place couldn't be determined, but from the writings it was deduced that she was a middle class housewife who wrote these 98 pages of cooking and pharmaceutical receipts. If you are curious to see the transcription here's the link, https://emroc.hypotheses.org/2162. When the group transcribed this book they also sent out a general challenge to the public to try out one of the receipts within the book, a receipt for "Lemon Wafers". As I said then, how could I resist? "Take duble refined suger beatt & dryed & sifted and mix with it Juce of a lemmon let it be of the thickness of huney & take some of it in a spoone & heatd it over a chafin-dish of coles till it be crisp on the side of the spoon let it not boyle; when itt is melted, Spred it on a paper out 4 Square: & then pin two Corners together that it may bend like other wafers; & so lett it dry when you take them of wett the rong side of the papers with watter." Now this isn't a picture of lemon wafer candy per-say, but the name of the painting is "Still Life with Wafer Biscuits" and it was painted by Lubin Baugin in the 1630's. 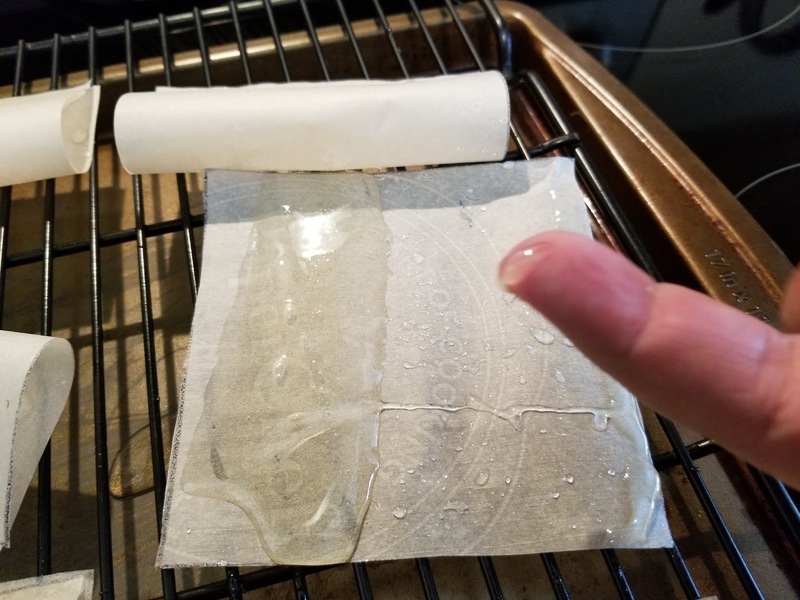 This is what, I believe, the end product of this receipt should look like, especially since the melted sugar/lemon mixture is put on paper and folded at the corners so "that it may bend like other wafers". I'm assuming, with that description, this is the shape that the final wafers were supposed to look like. So, in deciding to try this receipt again, I felt that I needed to go for a different approach. This time I would try to mimic the outcome rather than to follow the receipt word for word. This would mean that I would need some modern day tools and a crash course in candy making! So I took out a lemon and got started! I cut the lemon in half and strained the juice. And I found the amount of juice I got to be just below 1/4 of a cup of liquid. I think if I was going to employ using a spoon and a chafing dish that would be enough to work with, but I was doing things a bit differently and felt I needed some more liquid. So I cut and juiced another lemon. This brought it up to 1/2 a cup of lemon juice, which I figured would make enough syrup to work with. Now, the receipt says to combine the lemon juice with enough sugar to "be of the thickness of huney". Not very detailed with measurements. When I did it last time I found that for 1/4 cup of lemon juice I had to put in 3 times the amount of sugar. But I decided to opt for the recommended amount with most modern candy recipes, which seems to be a 2:1 ratio of sugar to liquid. So I measured out a cup of sugar and mixed it with the 1/2 cup of lemon juice. This created a thick, shiny syrup, but not as thick as "huney". But, again, I wasn't going for the exact receipt but rather figuring out what the outcome should be. I did end up tasting the liquid at this time and found that it still tasted like very sweet lemonade concentrate. Yum! So, once the sugar and lemon juice were well mixed, I put it all in a sauce pan and placed my newly acquired candy thermometer in the mix so that I could gauge when I would reach the proper temperature for each different candy stage. I also had prepared new wax paper squares from the template I used previously. I made sure I had four squares for each of the three stages I was going to test. So I put the heat on low and watched the temperature rise. The thing that always perplexed me was that Goody Dawson writes about not letting the mixture come to a boil in the spoon. I realize that the spoon has a smaller amount and space to heat up (and the dangers of it boiling over onto the coals) but I really didn't get how she could possibly get it hot enough to work into wafers if you didn't boil the sugar mix enough. I took this picture right about the time the sugar mixture started to boil and it was well under the temperature for even making syrup. Which is probably why I just had a sticky mess when I first tried it. So the sugar/lemon juice mixture continued to boil (and I played a little game of "move the small pan on and off the heat so that it doesn't boil over"). But, though my game hindered the temperature at times, it finally got to 250 degrees F. This is the beginning of the Hard Ball stage. It's good for making caramels. And this was the first stage I was going to start my test wafers on. So I took a tablespoon (literally a table spoon) size scoop and placed it on the paper square. 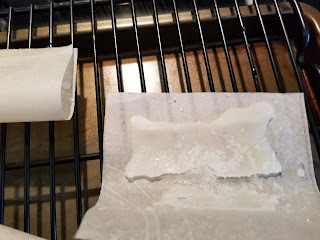 I gave it a minute to cool a bit (finding the liquid when it first was placed on the paper didn't spread) and then spread it all over the wax paper piece. I then folded it so that the corners would touch, like the recipe suggests, and still kept it circular on the bottom, hoping to mimic the wafer look she was after. I then repeated the process three more times, all the while moving the pan so that temperature would keep between 250 degrees and 265 degrees F. This way it would maintain the Hard Ball state. Then I put it back on the heat completely so that the temperature could rise to the next state, the Soft Crack stage, which is between 270 degrees and 289 degrees F. This would be the stage where salt water taffy is made. Once 270 degrees was reached I spooned out the liquid and spread it just like the previous stage. I noticed that this liquid was quicker to firm up and had also had become richer in color, changing from a light golden yellow to a light brown that reminded me of maple syrup. I then pinched the corners and placed it on the drying rack. Three more papers later and I had my four testers for the Soft Crack stage. Onto the next one! So up went the heat (still moving the pan around as needed, realizing why candy makers use bigger pots) and watched the temperature rise to 295 degrees, the beginnings of the Hard Crack Stage. At this point I must add I was starting to get a crick in my neck from watching the temperature. I had already burned several fingers with hot sugar syrup and I was also getting a headache from the lemony sugar smell that had permeated my whole apartment. Though this experiment was certainly a learning experience, I felt my new found respect for candy makers continue to rise. Once the temperature reached 295 degrees (actually closer to 300 degrees F), I took the last four spoonfuls and spread them onto the parchment papers. At this point the mixtures was MUCH thicker and cooled very quickly. It also had gone to a much darker brown than the previous stage. I could see why this would be the stage for making toffee. So, with four folded and placed Hard Crack sugar wafers, I had four testers for all three stages. Now all I had to do was wait a day to see what my results were! So, it might have been a few hours later than 24, but the next evening I decided to see if any of my testers worked! Now Goody Dawson said to use water to help get the paper away from the lemon wafers, but I did these on waxed parchment paper, so I felt that this step wasn't necessary since they would probably peel away easily. Or I hoped that they would. First up.... THE HARD BALL STAGE! Ummmmm, well, that was a nope! Though it wasn't as much of a liquid mess as my previous attempts, this one still ended up as a pool of syrupy stickiness. Nothing like the wafer shape I was going for. On a positive note, it tasted like lemon candy! So on to the next stage... THE SOFT CRACK STAGE! Well.... getting better.... but not quite. I found that it did keep a circle shape... for about three seconds before it collapsed into another sticky mess. But, again, it tasted great! Just not the wafer shape I was looking for. So... one more shot at it... THE HARD CRACK STAGE! YAY!!! SUCCESS!!! Sort of. It was holding its shape when I unwrapped it, though it didn't look as nice as the wafers in the pictures. But, when I touched it, I found that it was still malleable. So I used my hands to shape it into the wafer shape I saw in the painting. And it kept its shape! So exciting!!! I will say that they tasted really good but I was surprised at how dark they were. I guess, in my head, I thought they would be much lighter in color. But, still, I'm glad I figured out a way to make them! So, like all good experiments, this leaves me with even more questions. Should I have used more sugar and made the liquid more like honey? Maybe that would make a different outcome? But how did Goody Dawson make wafers from sugar she didn't even let boil? Just how did she cook the sugar/lemon juice mixture long enough to make candy that could hold its shape without boiling? And how to you prop a spoon on a chafing dish without burning up your hand and arm? 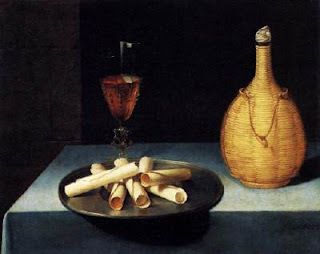 And did they look like the wafers in the painting or something completely different? So I think this won't be the last of Goody Dawson and her "Lemon Wafer" receipt! But I think I'll eat some candy and wait till my burns heal first before I attempt it again.